The earnings season on Wall Street began earlier this week. This period of time is an opportunity for companies not only to present hard financial data but also to comment on recent additions to their offers. One of the most eagerly awaited releases is the one of Verizon Communications (VZ.US) as it may offer the first insight into 5G technology interest. The US wireless market is dominated by two companies - Verizon Communications and AT&T. The two companies have been holding a combined market share of 60-70% throughout this decade in terms of the number of wireless subscriptions. However, since late-2015 Verizon managed to outperform AT&T by 2-3% of market share in each quarter. The potential for further outperformance is huge as with the start of the fourth quarter Verizon became the first company to offer commercial 5G technology products. Products using the latest generation of wireless technology were rolled out in four US cities. Initial offer covers 5G solutions for internet and television devices. However, Verizon teamed up with Samsung in order to develop a smartphone efficient enough to support this new technology. The launch of the phone is planned for the first half of 2019. According to GSMA forecast, the 5G is set to become leading network technology in the US by 2025. Research authors suggest that number of the 5G connections in the United States will surpass 190 million by then and will account for about a half of all mobile connections in the country. As Verizon is the only company in the US already offering 5G products, it may be set to boost its market share at the cost of its major rival - AT&T. While significant developments in the 5G sphere were made during the past few years, one should not forget that it is still somewhat new and its true potential is yet to be unveiled. However, this may take time and Verizon executives are aware of this fact. Having said that, the company still aims to keep its LTE business as the leading profit-driver during the next couple of years. Taking a look at the first three quarters of 2018 one can see that the company should not be worried about staying afloat until 5G takes over as the main source of growth. 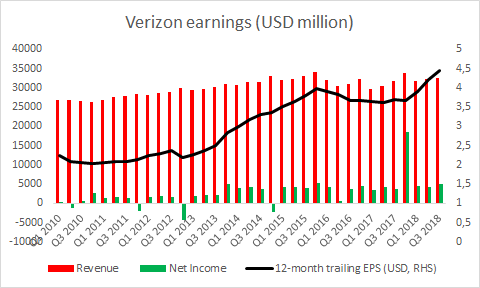 In the period between January and September Verizon generated $26.24 billions of operational cash flow, above the result achieved throughout the whole 2016 or 2017. Such an outperformance was a result of clients shifting their preferences towards more expensive subscription plans. In turn the company managed to reduce its debt load by $4.2 billion. The company also experiences constant net subscriber additions with customer pool rising to over 146.3 million subscribers at the end of September 2018. Now let’s take a look at how Verizon compares to its main competitors. The peer group we used for this comparisons consists of only 4 companies, including Verizon, but at the same time covers over 95% of the US market. The comparison shows us a mixed picture. 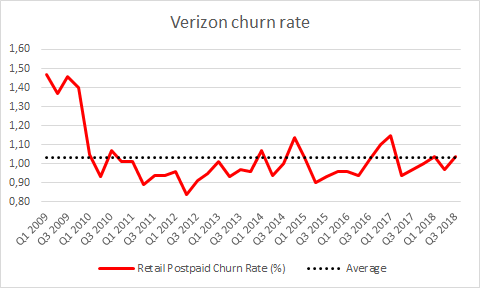 On one hand, Verizon’s clients exhibit above-average brand loyalty as pictured by the churn rates. Data on margins shows that Verizon is more profitable than its peers. On the other hand, company is significantly more leveraged. Degree of indebtedness explains abnormal return on equity. Still, when we take a look at return on assets, metric that omits the impact of the financial leverage, we can see that Verizon is outperforming its peer by a huge margin. When it comes to liquidity, Verizon’s quick ratio is somewhat higher than average and its cash ratio is lower. To sum up, superior profitability and efficiency is more than desired feature but amount of debt may raise questions. Apart from being superior to its competitors in terms of most financial metrics, Verizon is also a promising long-term pick due to its dividend policy. Verizon did not missed a single year of dividend payments during the past three decades. After a few years of stagnant dividend payout in late 1990s and early 2000s, the company began to share a bigger portion of earnings with shareholders. 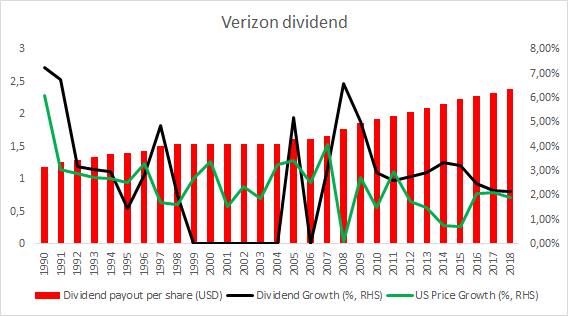 Since 2005 Verizon’s dividend rose each year and reached $2.385 in 2018, providing investors with a dividend yield of almost 4.25%. While prospects for Verizon’s core business remain upbeat, the reception of its 5G products is crucial. It is unlikely that the rollout of these products will provide any major boost to the fourth quarter earnings as Verizon granted each of its current customers a right to receive a free 3-month trial of the service. Non-Verizon wireless customers will be charged $70 per month for the service. Nevertheless, Q4 2018 earnings announcement will be important one as it may offer first insight into consumer data related to G5 technology. Depending on how big interest clients expressed in the technology as well as whether and what problems arose with its broader implementation may be crucial for the pace at which Verizon will launch the service in the other parts of the United States. This in turn will be crucial for whether Verizon will retain its position of a leader in this segment or not. The company will report earnings for the last three months of 2018 on 29 January.